I have documented my transference of my CD, SACD, and vinyl collections to digital (DSD) files in other threads. It was important to me to have my music collection at my fingertips and not be bound by the inconveniences and disadvantages of physical media. This was particularly true with regard to vinyl records. I was not enthusiastic about transferring my video discs to digital files due to the work involved and due to the fact that I enjoy watching videos a few hours a week compared to listening to music a few hours a day. Furthermore, I seldom watch movies back-to-back. Going to the media racks, picking out a disc and inserting it into the player are not frequent inconveniences. Out of curiosity, I recently did a "proof of concept" trial in which I ripped some DVDs and Blu-rays to a hard drive housed in an external enclosure. The enclosure was connected to my Oppo UDP-205 universal player by USB cable. After a few days of playing with this, I was hooked...and I began making plans to convert my entire video disc collection to a NAS-based storage system. Figure 1. Proof of concept: DVD and Blu-ray video from the hard drive. 8 TB hard drives residing in a small Network Attached Storage unit. Figure 3. Synology DS918+ NAS. The unit measures 6.53" H x 7.83" W x 8.77" D.
There are many excellent tutorials on how to rip DVD and Blu-ray content, therefore I will not expound on that here. The Oppo UDP-205 automatically indexes the contents of storage devices attached to it. The contents of the hard drive attached via USB cable could be displayed on the TV either by folder or by filename. There was no file-level search functionality in USB-connected drive. A particular file or folder had to be located by scrolling through the entire list. With a DLNA compliant storage device, such as a NAS, attached to the UDP-205, searching can be done for a particular file or folder. DVDs were ripped to MKV format, with no loss in picture and sound quality. Subtitles, audio tracks, and chapter breaks were preserved. I did lose the menus. The main movie, trailers, and other extra content were separated out as individual files. 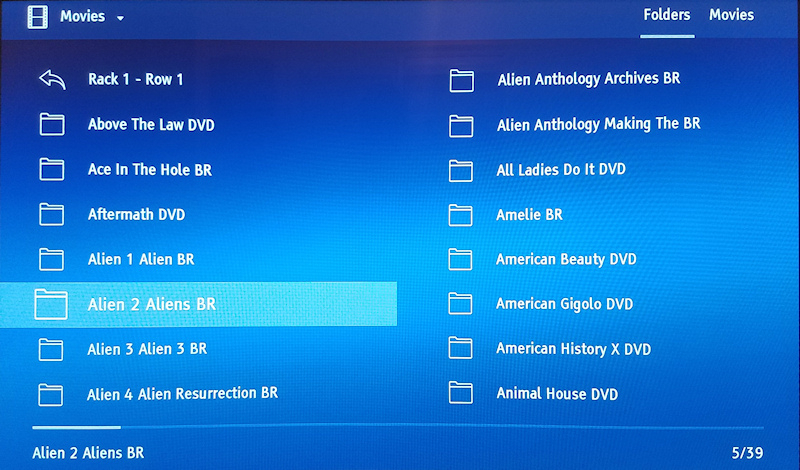 Using the DVD menu as a guide, I had to individually go in and rename each separate file. A few times, MakeMKV failed to pick it up some or all of the preview trailers, even thought they trailers played fine from disc. No big deal. The only method I know of to retain ripped DVD menu functionality is to rip the entire disc to a folder and then use a software player such as PowerDVD (Oppo confirmed this). However, a software player is not going to provide the processing power and picture quality of a high end hardware player such as the UDP-205. My PC, which has a 6 core (12 thread) Intel processor and 24 GB of RAM, takes an average 10 minutes (often less) to rip a DVD to MKV files, then I spend an average of 10 minutes labeling the MKV files. Blu-rays take an average of 25 minutes (often less) to rip. Figure 6. Clicking on an MKV (DVD) movie file title begins playback. Blu-rays were the easiest to process because all that was required was making a folder with the name of the movie and copying the contents of the Blu-ray disc into that folder. The folder then had to be processed with a utility called "BDMV Modifier 2.0" so that the UDP-205 would treat the folder as a "disc". 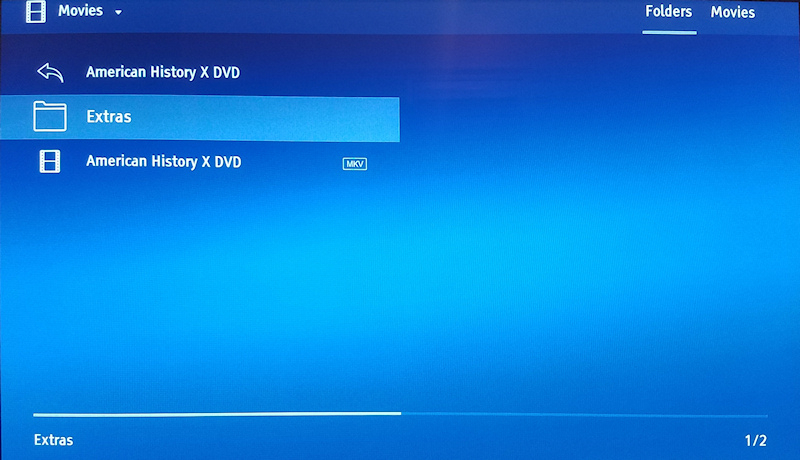 The BDMV modifier utility can process Blu-ray folders individually or in a batch. During a ripping session, I put all the individual Blu-ray movie folders in a single folder and select that single folder for processing. Every individual folder is processed and I receive a confirmation stating the number of titles that were successfully processed. Figure 7. 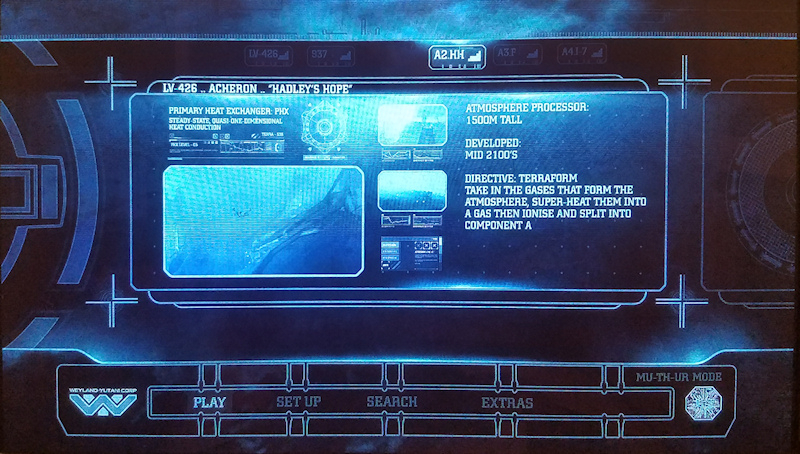 Clicking on the folder for "Alien 2 Aliens" Blu-ray immediately brings up the disc's interactive menu, and playback is identical to playing from disc. Figure 8. Menu for "Aliens 2 Aliens". I went through my collection and cataloged each disc - even the bonus disc(s) - of a title, into an Excel spreadsheet. For capacity planning, each DVD disc was assumed to be dual layer with a maximum capacity of 8.5 GB. Each Blu-ray disc was assumed to be dual layer with a maximum capacity of 50 GB. Approximately double the calculated used space was the target for total NAS storage. Four 8 TB Western Digital Red drives were selected for the Synology DS 918+ NAS. After formatting, approximately 90% of that 32 TB, or 28.8 TB, will be usable storage. In practice, due to the fact that many of my DVDs are single layer with less than 4.7 GB content and many of my Blu-rays are single layer with less than 25 GB content, the actual used storage capacity required will be significantly less than the "max case" scenario of 17 TB. I have completed ripping the first 5 rows of rack 1, which had a calculated space requirement of 4.496 TB. The actual space requirement was 3.509 TB, or 78% of the calculated requirement. If the 78% difference holds until ripping is completed, the actual total storage requirement for the entire collection will be in the area of 13.3 TB. The actual free storage space in the NAS will be approximately 28.8 TB - 13.3 TB = 15.5 TB. I buy an average of 10 Blu-ray discs a year (0.5 TB/year max case). Therefore, at my present rates of consumption, this amount of available storage should last well over 25 years. I expect the drives to wear out long before they fill up. This assumes that I don't buy a 4K TV and develop a ravenous appetite for 4K Blu-rays which are 100 GB a pop. Ray, I always like you posts. Very informative and detailed. I plan to do this also in the not so distant future and definitely will review back to this thread and also seek the assistance of this forum and the internet. By the way, my 4K collection is growing fast.....ouch at 100 GB a pop. Nice choices on HDD and NAS brands. Synology is a great choice! Have you considered Plex for playback? The GUI is really nice, compared to the text-based interface of your disc player. How loud is the fan on the Synology ? I keep debating between a Qnap and Synology. 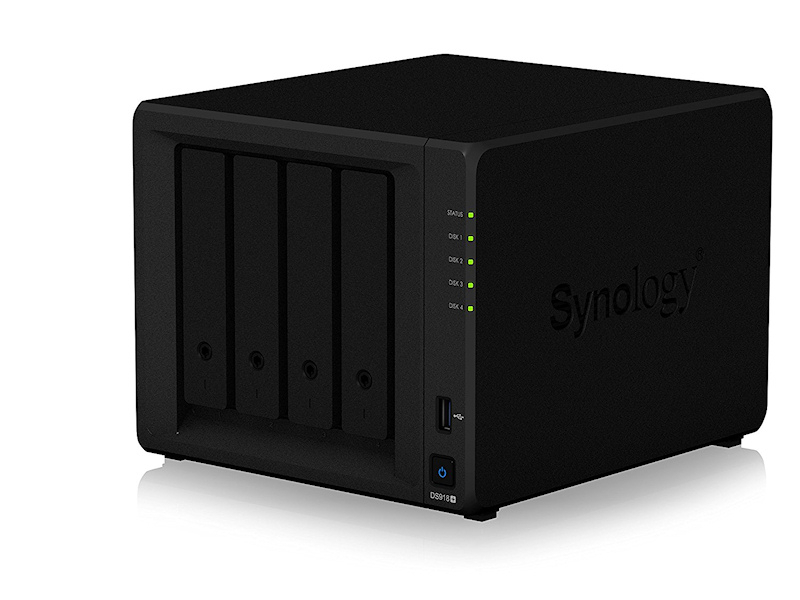 I have a four bay Synology 916+ which is the previous version to the 918. Fan noise is not an issue, but when set up in a RAID configuration it will go through periods where the drives are running to do checks. I can’t say it is quiet when it does that, but I don’t have experience with another NAS to say it is any different from another comoany’s product. I have mine in myseparate office and use it as a server and streamer over wifi. 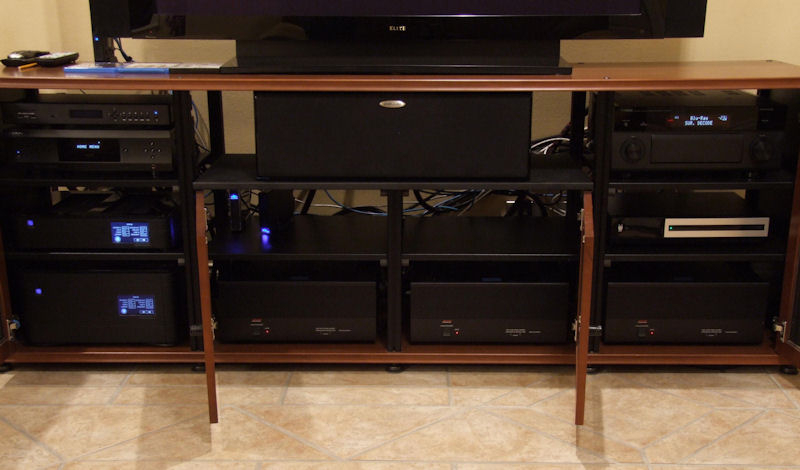 If the possibility of minor noise is a concern a NAS directly connected to a home theater may not be the best choice compared to streaming or using more passive USB drives. The minor noise issue would not bother me. If it is inside a cabinet the noise should not be noticeable. The drive on my FIOS DVR makes as much noise when it is recording or playing back. My current nas is in my bedroom. When I change, it will either be in my bedroom or audio room so I want to make sure it won’t be too noisy. I use Plex to stream video from my home office PC to my home theater TV. I was considering using Plex to tie everything together when I was looking at a HTPC/video server configuration. I have a four bay Synology 916+ which is the previous version to the 918. Fan noise is not an issue, but when set up in a RAID configuration it will go through periods where the drives are running to do checks. I can’t say it is quiet when it does that, but I don’t have experience with another NAS to say it is any different from another company’s product. I have mine in my separate office and use it as a server and streamer over wifi. The dual fans on the rear gave me some concern about noise, but I didn't find any complaints about fan noise. Plus, the 918+ will be sitting in the back of a cabinet 13.5 feet from me. I won't be doing a RAID configuration, at least not initially. Backups will be done the old-fashioned way with external backup hard drives. The DS 918+ can be expanded to 9 drives. I might add four more drives and do a mirrored RAID configuration later. I will say this... with the fans... Drobo isn't the quietest kid on the block... but with RJ45 connectivity... it doesn't have to be local/in the room. I've ripped all my CD music to lossless files, and also have about 5% hi-res FLAC content. Still plenty of capacity for all my video library which I've been reluctant to rip to disc ... as of yet. Thanks for your post DK.. gives me more info on possible solutions to what I might want to use in this video arena. Glad its working for you. I've been ripping blu-rays and DVD's using MakeMKV to my HTPC for quite some time. Its super easy and once your done it makes picking a movie with friends super easy. No need to rummage around and yell out movie titles, or see if you have a certain title. I'm also a huge fan of Plex for playback. My main reason for going with this was actually something I dont think you have to deal with, which is kids. By using Plex to playback I can setup a folder structure where the kids movies are all housed in one location, allowing me to basically filter their list from the start. It also avoids discs getting scratched, fingerprints or food on them, and anything else associated with storage or loading of discs. 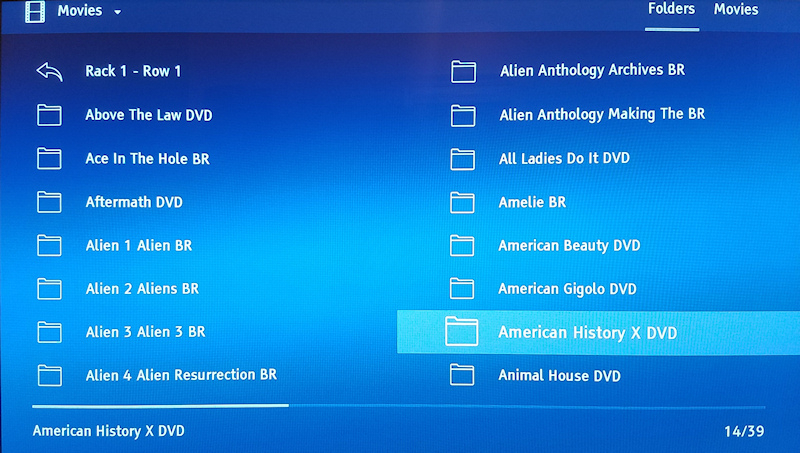 They fire up the Roku, go to Plex and their folder and BAM, they can watch anything there. Also makes having sitters over easy. "See this folder. Anything here is pre-approved for them to watch". I also find myself being more selective about what FORMAT I copy movies over. DVD is good enough for me most of the time as blu-ray can take up lots more space as you saw, and I dont feel like having to re-encode them to compress them. So I am picky about what I rip in blu-ray quality over DVD. I also like that I dont need a dedicated blu-ray OR CD player in each system, just a device that can playback the formats. In my case I use Roku's for 2 of my systems because they are small, easy to hide, easier to use and super cheap . I do "technically" have two blu-ray players but only because my Xbox one comes with one, and my HTPC has one to rip the movies, but I dont use them to actually play movies or CD's much anymore. And last thing about Plex I like is that I can set it up to be accessible from anywhere on any device running the Plex app. Since my music is also there, it means I can play any movie or music I want from my house when I'm out and about. Road trip with the kids.... they can watch movies via Plex on their tablets, I can stream my music playlists to my car, and my wife can watch movies or listen to her music. Its super cool IMHO. Anyway sorry for the off topic Plex shameless plug lol. One of the potential drawbacks to a server located away from the home theater is Blu Ray rips may have speed problems over wifi. Besides being larger files than DVD they need more bandwidth and a strong wifi signal. For that reason I have just ripped DVD’s. I tried a couple of Blu Rays and found the mkv files would not play back cleanly over wifi. 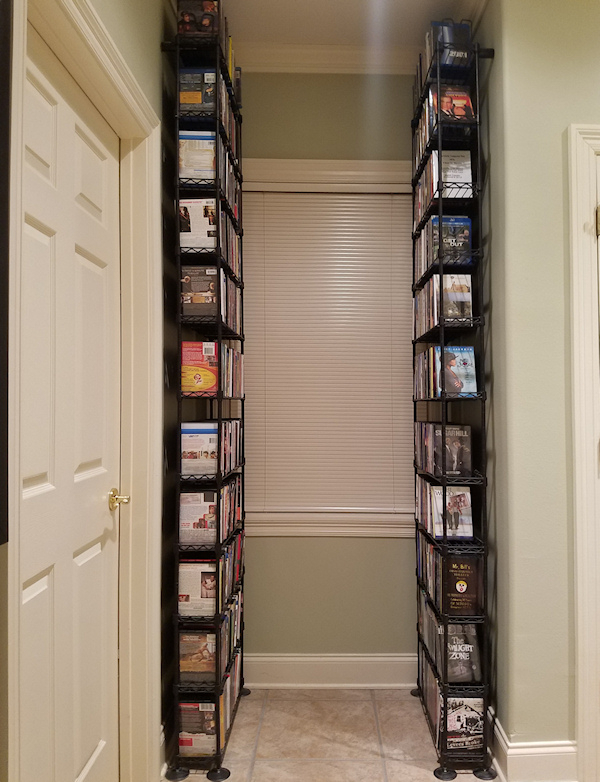 I have above 2000 Blu Rays which would take a lot of time and space to rip and store, but they are all in the home theater space. One thing I have been looking into is paying the $2 to Walmart to get a digital version of some Blu Rays I own on their Vudu service. They seem to have improved their system a lot in the last year. I haven’t tried their upgrade system, but I do have a couple hundred movies there through the Ultraviolet code system. Of course, not all movies or TV shows are availabke from them. While correct, all main system components in all 3 systems are hardwired via Cat6 so buffering at the house is not a problem. Additionally in the Plex menu on each device IIRC you can go in and downgrade the video quality to solve that problem on that device while not affecting the others. If you are streaming multiple places with the same file at diff resolutions I'm sure your CPU takes a hit, but its never happened, or if it did, the speeds weren't effected enough to notice. Plus do I care if my iPhone isnt showing in 1080p? Nah. Same with the tablets. Since the hardwired Roku's are only 720p anyway, the loft and bedroom are stuck there at min, which again smaller TV's, not main room, dont care. My HT using the Xbox one gets the full 1080p on the 60" screen. Another pimp for Plex. But then I also am using an actual (pair of) servers to host my media versus a NAS. I have a mix of hardwired and wifi devices I stream to and have never experienced any lag issues with Plex. When I first got into ripping my DVD (and subsquently Blu-ray) collection, I thought it would be best to rip them so they could be played back just like the disc. I ended up ripping the DVDs to an .iso format and used a Western Digital media player that could read those files and play them back. Each .iso when read pulled up movie like it was on the disc - with no loss of video quality. I thought that was all good and great at the time. As the Blu-rays increased in my collection, I didn't want to chew up as much NAS storage ripping them to .iso. Additionally, the Western Digital media player did not have an interface that was wife friendly and I started looking elsewhere. I ended up selecting Roku as our new media player (for all our TVs) and upgrading to a Synology 415+ as our new NAS with Plex Server installed on the Synology. As the Roku wouldn't play the .iso files, I went with MakeMKV as my media ripper to extract the movies from the disc. I was only concerned with the movie itself and didn't care for the trailers and other extras. I figured if I wanted to watch that, I would go back to the disc. As MakeMKV kept the movies uncompressed from the disc, I used Handbrake to compress the .mkv files to .mp4. This allowed for further compression for what I perceived as not much video degradation. Sometimes I can see some added banding in bright sky scenes, but most of the time on our 55" screen I don't notice a difference. With Plex, you can choose the quality of the video stream as well as what audio stream you want to listen to. So when using Handbrake, I compress the video but keep most of the audio streams in the .mp4 file (DTS-MA, DTS and Dolby Digital). My reasons may not be the same as everyone else for using Handbrake. We have two kids (4 & 2) and ripping their movies to the NAS in .mp4 format makes it easy for them to watch the movies from any Roku device in the house. As I only have our main TV hooked up through CAT6, the rest of the Roku players are hooked up via wireless. A full Blu-ray in .mkv format without compression has too many issues over wireless. Hence one of the reasons to go with compressed mp4. Additionally, the Synology NAS I picked a few years doesn't have the horsepower to trans-code large files (.mkv) on the fly without intermittent issues. Granted, Plex will play .mkv files, and for some movies/shows I keep them in .mkv if I just want the exact copy of the Blu-ray. These are more of my favorite titles, but for the one offs and kids movies I rip them and compress to .mp4. 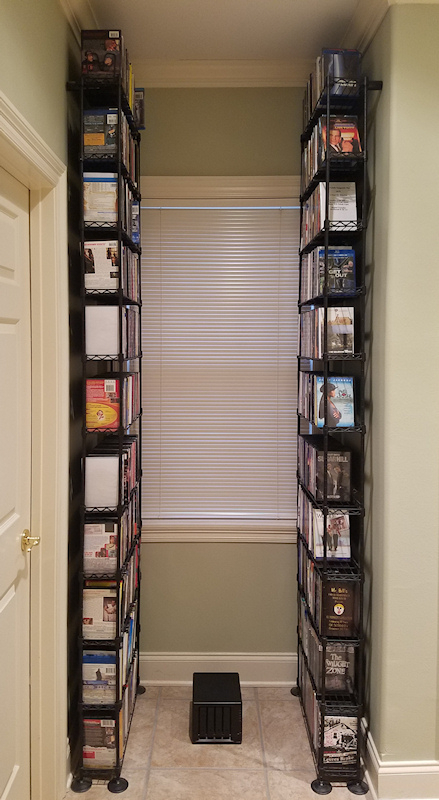 With the current setup (NAS, Plex, Roku) my wife has no trouble browsing movies for the kids or watching episodes of TV shows we've purchased. We have also ripped all our Beachbody workout programs and put them on Plex so that makes it easier to pick a workout routine and just go. The wife definitely likes that feature. It is important to know your end game when you are not only ripping, but playing these files as well. If you end up choosing Plex are your media server down the road, you should consider looking at the naming convention that Plex requires in order to organize your media. I learned little tidbit when converting over to Plex, and had to rename a large amount of files in the naming format required by Plex. Regardless, you will enjoy your new found way of watching movies from a server rather than a disc player. Still no method for ripping 4k movies to my knowledge, but when that day comes I'm sure I'll be doing that as well. Still no method for ripping 4k movies to my knowledge, but when that day comes I'm sure I'll be doing that as well. Actually, there is...but it is limited to say the least. A Russian company has cracked *some* of the AACS2 encryption but only on a limited number of 4K discs. To take advantage of this though, there are only 2 or 3 internal drives currently capable of reading the 4K discs. Then there is the matter of the $300 (or maybe it is $200...) software and then there is the number of discs that have actually been cracked...only 70 or so at this time. Are 4k rips actually in the ballpark of 100GB? Talk about chewing through storage. Just like 1080p HD BDs, the size can vary but 100GB isn't uncommon. Synology 1817+ user with Plex here. One very nice feature of Synology is their unique raid technology allowing you to mix-and match drive sizes - handy when you buy larger drives as they come down in cost. I have both Roku's and NVidia players. The NVidia Shields are far superior to the Rokus for speed and will pass through Dolby Atmos and other high res audio formats that Roku, Apple, Google chromecast, and Fire do not yet do. The NVidia's also have chromecast and google home built-in. If anyone needs a bare-bones Synology 916+, let me know as I am not using it and will deal..
From what I've read, there is no software out there that can decrypt a 4k disc. There is software that can rip a 4k disc if it is unencrypted. There have been some discs that have been pressed that are not encrypted and rips from those discs have appeared online. However, from my research I haven't heard of the encryption on 4k discs being cracked. The Russian crack you mention was in the news, but it doesn't appear to be a crack of the AACS 2.0 encryption. This is in reference to DeUHD Software. "To sum up the results: It works, but they don't appear to have cracked AACS 2.0 itself. Instead, the DeUHD developers appear to have found working keys for specific films." Reference Here. "It will even read 4K and 3D Blu-ray discs but, as I understand, only on those drives that have a Service Code NS50 on the top label." What are the minimum system requirements for Ultra HD Blu-ray movie playback? That is in fact one of the 2 or 3 BDXL capable drives available. I have 2 of them in my ripping server and they will read the disc but they cannot decrypt the disc. That's a software issue. I should have clarified. DEUHD does not in fact break AACS2 but provides encryption keys for very specific discs. In "darker" circles, it is rumored that all the Russians have actually done is brute forced their way into a handful of discs and are charging for those keys they have cracked with DEUHD then being able to strip the encryption from those specific discs. @DarqueKnight Nice wright up although I do have a question ? During play back have you noticed any "out of sync" issues with the video audio and subtitles also any problems with forced subtitles. I've been doing this for over 18 years, back when a 2 Ghz Pentium 4 cpu was top dog and frame serving was the only way to convert a DVD movie to put on your PC and took about as long to do as the length of the movie, that's if you didn't have any problems with the audio video sync or forced subs, Just thinking about it is giving me a headache. Now days I just copy the movie only as a DVD with one audio and subtitle (in the case of forced subs) track no conversion needed. I don't do Blu-Rays for reasons I won't go in to here. BTW: I'm pushing close too a thousand DVDs that I expect to pass this year. @GospelTruth ALL digital video is compressed, Mpeg2, Mpeg4, Mpeg4 AVC, VC-1, Divx, Mkv, Wmv etc.. are all lossy compressors. Where can I get some of this "Russian crack"? Is it better than Krokodil? Yes, I am aware of that. With Handbrake, it is just further compressed from the video that is on the disc. I should have been more explicit. None so far. At this point I have processed 185 DVDs and 104 Blu-rays. Then enjoy the freedom of movies at your fingertips. I must say, I am enjoying the freedom of movies at my fingertips far more than I expected. There is also the advantage of being able to stream movies to networked players in my home office and master bedroom. I am 65% done (all 11 shelves of the first rack and 4 shelves of the second rack). I expect to be done with this fourth ripping project sometime near the end of February. 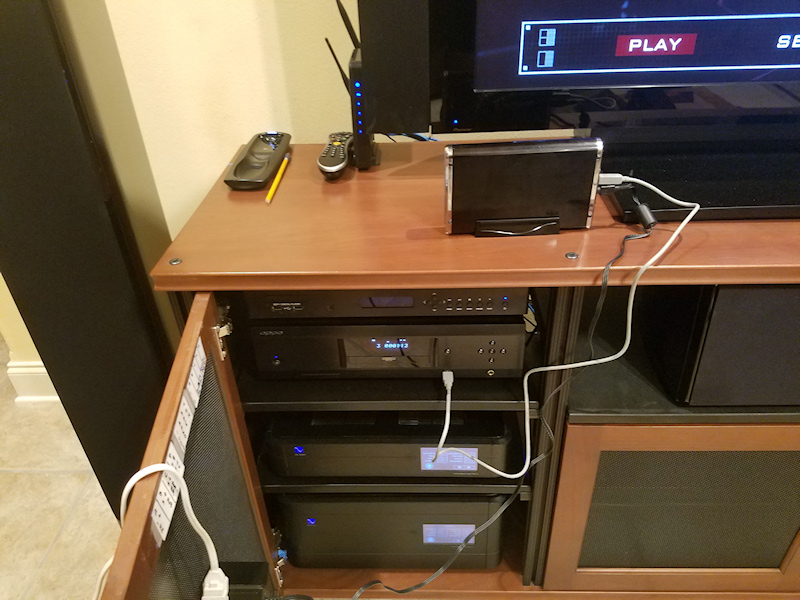 My entire 800+ video disc collection will occupy less than half of the storage capacity of the Synology DS 918+ NAS shown between my video media storage racks above. I set up an efficient ripping "lab" with three computers: The desktop and laptop computers in my home office and the desktop computer in one of the guest bedrooms. Therefore, I can rip three discs at a time. The Synology NAS was very easy to set up and configure. Shortly after set up, a window popped on its web interface telling me that the NAS had analyzed my home LAN's speed and determined that it was two slow to wirelessly stream high definition content. I already knew that. That's why I was already planning to replace my wireless-N gear with much faster wireless-AC gear. It is amazing how you dont think it will make a difference, but once you start using it, you realize just how convenient it is and you start using it more. I like to handbrake all my video files. Years ago, I actually found that I sometimes had dropouts with full 1080p Bluray rips, even with wired ethernet. Granted, this was with an older HTPC that only had a 100Mbit ethernet port. Now, everything in the house is Gigabit wired. However, I've never felt that my quality suffers when I handbrake 1080p using default settings (slider on 20). Bluray rips shrink to 10GB or less, DVD's shrink to under 3GB, both without noticeable loss, and that is usually watching on a 100" projector screen.